JAWS producers Richard Zanuck and David Brown’s original concept for the second JAWS sequel was a spoof entitled JAWS 3, PEOPLE 0, possibly to be directed by PIRANHA’s Joe Dante. Universal balked and settled for more of the same shark-bites-man mayhem, except this time it would be in 3D (“The third dimension is terror!”). The result, JAWS III, is probably as funny—albeit unintentionally so—as the original spoof idea would have been. 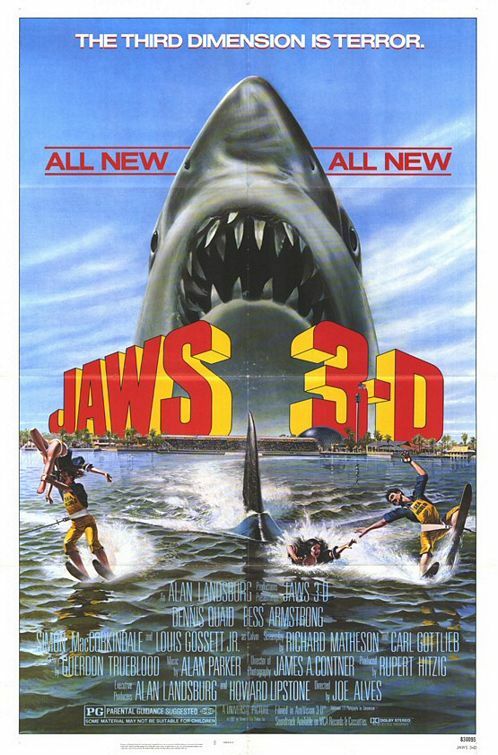 The 3D gimmick alone was responsible for its modest box office success in the summer of 1983, because JAWS III (theatrical title: JAWS 3-D) is a cheap-looking, dully plotted mess with indifferent performances and shoddy special effects. Hard to believe the great Richard Matheson (DUEL) had a hand in writing the screenplay (the story is credited to THE CANDY SNATCHERS’ Guerdon Trueblood, though it’s unclear if he had anything to do with JAWS III), though I suspect Universal executives and script polisher Carl Gottlieb (a veteran of JAWS and JAWS 2) are more responsible for the film’s lack of quality. The story brings Mike Brody (a visibly disinterested Dennis Quaid), the son of Roy Scheider’s JAWS police chief, to Florida, where he works as an engineer at Calvin Bouchard’s (Lou Gossett Jr.) new Sea World park with his girlfriend, marine biologist Kay Morgan (Bess Armstrong, who was also the female lead in HIGH ROAD TO CHINA that year). While his younger brother Sean (John Putch) is visiting for Sea World’s grand opening, the park is victimized by a 35-foot great white. Universal’s choice of directing neophyte Joe Alves, the production designer on JAWS and JAWS 2, was one of many missteps that contributed to JAWS III’s failure to scare, thrill, or entertain. Gossett, who made this just after his Oscar-winning turn in AN OFFICER AND A GENTLEMAN, is lousy, but he’s also the only actor with life to his performance. The killer shark looks like Styrofoam in many shots, and the blurry matte work and phony 3D effects make the Bruce the Shark on the Universal Studios tour look downright threatening. Universal was too cheap to bring back John Williams, so Brit Alan Parker (DEMPSEY & MAKEPEACE) contributed a forgettable score. As mentioned above, JAWS III was a hit, and JAWS: THE REVENGE followed.